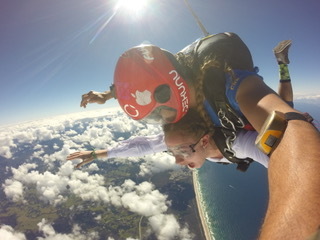 Goldburt went skydiving above Byron Bay in New South Wales during her study abroad two years ago in Australia. Abby Goldburt came south to college because she wanted to get away from the frigid winters in her home state of New Hampshire. 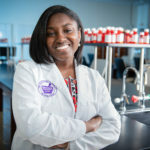 When she toured campuses with her parents, she visited High Point University, and once she stepped into one of the most innovative biomechanics labs in the country, she knew. “I want to go to High Point,” she said. “If you really want to …” her dad said. “I do really want to,” Goldburt responded. That one conversation for Goldburt has led her to so much. She is HPU’s Extraordinary Leader for the month of March. 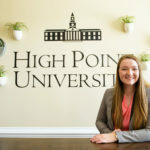 She’ll graduate in May, start HPU’s physical therapy program three weeks later and spend the next three years going after a doctorate that’ll help her become a pediatric physical therapist. HPU, Goldburt says, helped her define her future. It also turned her into a leader in the most unexpected way. She went to Australia and saw herself in a whole different light. 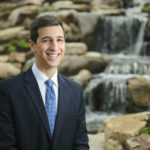 Bradley Taylor, an HPU Success Coach, noticed the change. 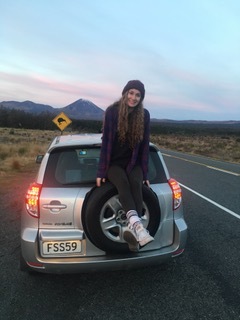 Taylor is the staff advisor for Alpha Lambda Delta, the freshman honor society at HPU, and Goldburt came back energized after spending the spring semester of her sophomore year at the University of New South Wales in Sydney, Australia. 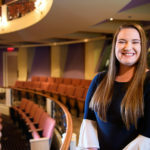 She joined Alpha Lambda Delta’s events team and came up with ideas that brought people together. Goldburt joined the team because she wanted to do more than list Alpha Lambda Delta on her resume and slip its red-and-gold cord around her shoulders at graduation. Goldburt wanted to feel like she earned it. Goldburt didn’t stop there. She became president her senior year. That surprised Taylor. He always saw her as positive, but not bent on becoming a leader. That changed after Australia. She wanted to become president of an organization she believed in. Goldburt gets a pie in the face during her fundraiser last fall to raise money for help families in eastern North Carolina who lost their homes because of Hurricane Florence. Last semester, Goldburt dreamed up an event that could raise money to help those families in eastern North Carolina devastated last fall by Hurricane Florence. Her event raised $2,000 — $2 and $4 at a time. She and her fellow honor society members convinced a dozen professors to sit in a chair on the basketball court at the Slane Student Center and have students smear a pie of whipped cream in their face. Goldburt called it “Pie Your Professor.” At least 50 students came, and they spent $2 for one pie or $4 for two to do the deed. But it wasn’t just professors who got pied. The officers of Alpha Lambda Delta got pied. That includes Goldburt. She got a pie in the face five times. And what did she learn? The whipped cream is really cold, students and faculty really can have fun together and she really can take an idea and make it work. Goldburt is a rock climber. She started at age 12 and became part of a team at a YMCA near Bedford, New Hampshire, a small historic town near Manchester. 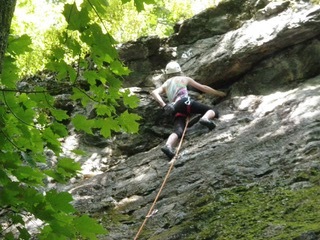 Goldburt started rock-climbing at age 12 and scaled walls like this one in Rumney, New Hampshire. Goldburt competed until she was 18, earning smooth fingertips and a row of calluses across the palm of her hand. She learned to slow down her breathing, sing a favorite song to herself and focus intently on the next hold. During that time, she got interested in medicine. Her only sister, 14 years her senior, is a doctor in Massachusetts. Her mom is an X-ray technician. Her dad, a project manager for a paper-product manufacturer, needed physical therapy to recover after breaking his left knee during a skiing accident her freshman year in high school. She went with her dad, and she realized she wanted to be a physical therapist. That’s how she found High Point University. Or really its Human Biomechanics and Physiology Lab. 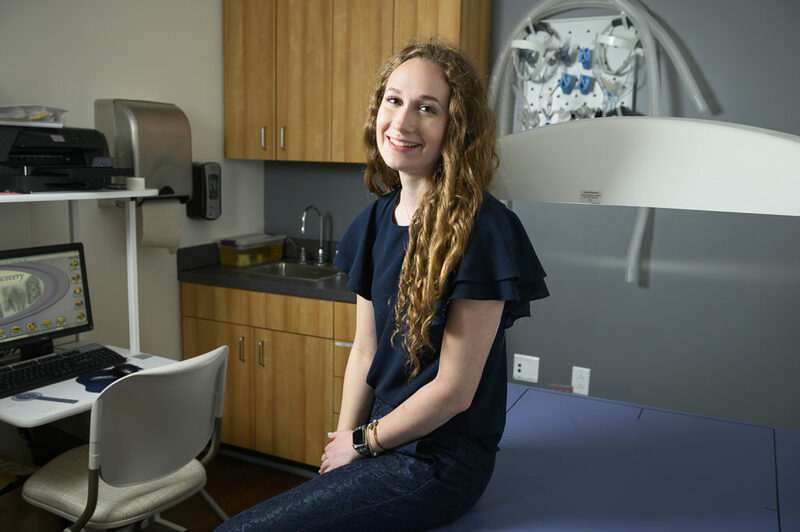 She saw the biomechanics lab as a place where she could learn, have some academic fun and work with talented faculty on equipment found hardly anywhere else on a college campus. Goldburt couldn’t wait. HPU’s biomechanics lab is the largest of its kind in the nation. 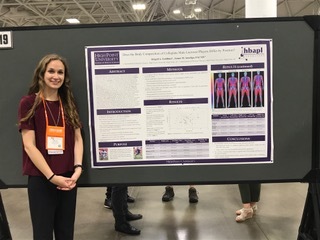 Goldburt spent three hours last May standing beside her poster in Minneapolis explaining her research into body composition of athletes during a conference sponsored by the American College of Sports Medicine. “I knew I’d have more room to have fun,” she says. For three years, Goldburt has collaborated with Dr. James Smoliga on his research. Last year, she teamed up with Smoliga to start her own research — measuring the body composition of athletes. 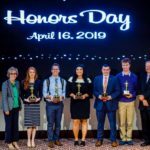 In May, she went to a conference sponsored by the American College of Sports Medicine in Minneapolis and presented her findings. After coming back to campus, she jumped into more research. This time, it was with HPU’s Summer Research Program in the Sciences, better known as SuRPS. She worked with Dr. Kevin Ford and participated in two research studies in which she looked into the role cleats play in a player’s performance and investigated how female soccer players could strengthen their knees to prevent injury. All this work came after Australia. All that happened because of HPU. Goldburt discovered her savvier side during her study abroad two years ago in Australia. That included a 12-mile hike on New Zealand’s Tongariro Alpine Crossing, where it was so cold Goldburt’s hair was frosted with ice. This photo was taken before she and her roommate, a student from Georgia Tech, went on the hike. Two years ago in Australia, Goldburt did much during her five months. She studied psychology, sociology, William Shakespeare and biomechanics at the University of New South Wales. She also bungee jumped in a valley in New Zealand, snorkeled along the Great Barrier Reef and jumped out of a plane at 14,000 feet with a skydiving instructor on her back. She found her time abroad transformative. She made friends, became more independents and began thinking differently and relying on her smarts to explore a new country. She saw her life through a different lens, and she realized she wanted to come back to campus and make a difference, stand out and prove to herself she could do it.